Here are 7 fascinating museums and sites that help tell the story of the D-Day Landings. Bob Zeller has recently started using the Garmin Edge Explore GPS unit on his cycle tours. He discusses its relative merits. Download the full road book for cycling the Côte du Rhône vineyards in the Vaucluse area of Provence. There is now an English-language guidebook from a mainstream publisher for cycling the Canal de Garonne from Bordeaux to Toulouse. Cycling in Paris? Here is a map of all official bike lanes in Paris, plus tips and links to help your planning. 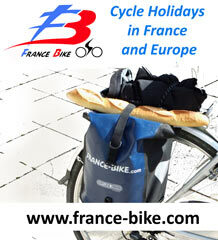 I thought I'd post a short blog with some quick tips on finding French trains that take bikes. 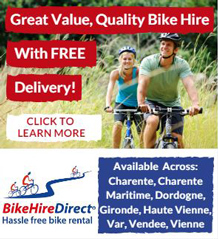 Need help arranging your cycling holiday in France? Then this page is for you. If you are looking for an epic canal bike ride in France, then these 10 ideas from Richard Peace might provide the inspiration you need. Clos du Magnolia is a gem of a B&B. 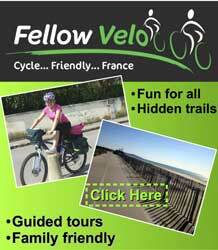 It's run by cyclists near the Orb River, just 20km north of Beziers. There are so many French wine areas to explore by bike – Caro Feely has this guide to help you decide where to start. Britta Sorensen takes a springtime ride along the Canal des Deux Mers à Vélo and reviews the route between La Reole and Agen. The V90 Véloroute Voie Verte de la Vallée de l'Isle goes from Moulin-Neuf, near Montpon-Ménestérol on the Dordogne/Gironde border, to Perigueux. 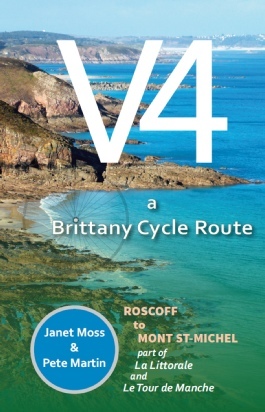 If you're cycling the northern French coast between Roscoff and Mont St Michel, then the V4: A Brittany Cycle Route could be the guidebook for your pannier. Review by Richard Peace. 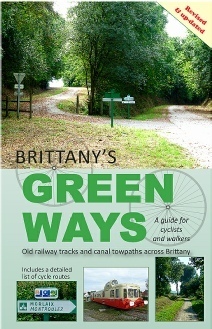 An English guidebook has now been released for the popular Paris to Mont-St-Michel Veloscenic bike route. Everything you need to know to enjoy a cycling holiday on Île de Ré, an island off the west coast of France. Richard Peace has this bike route suggestion for cycling from Calais to Paris. 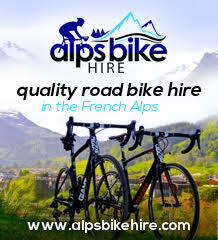 You may need a medical certificate for all cycling competitions, sportives and even some local leisure rides in France. Here's a template you can use. 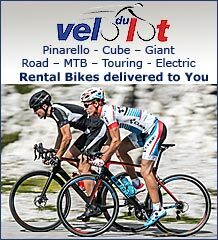 B&B, hotel and chalet accommodation in the French Alps, Morzine, Grenoble, Alpe d'Huez, Galibier, and on other Tour de France cols. The largest public park in Paris, the Bois de Vincennes, is an absolute delight for cyclists. Here's how to enjoy it by bike. Cycling in France hasn’t always been easy for vegetarians – we have these tips to help make it a bit easier. 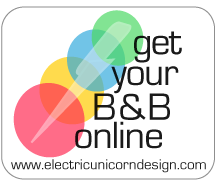 Here is a do-it-yourself itinerary for cycling the Canal de Garonne from Bordeaux to Toulouse. 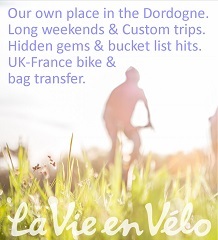 Need ideas for your Burgundy cycling holiday? Vineyards, canals, Beaune, cathedrals and ancient ruins – here are 10 things to put on your must-see list. We sent Jacqui and Adrian Brown off on La Sarthe à Vélo to check out one of France's lesser known cycling networks. Here are their daily reports. Heading out on the Paris to Mont St Michel Veloscenie bike route? Here are 7 things to factor into your itinerary. France is blessed with hundreds of kilometres of world-class mountain bike trails – here are five of the best. Ravi Nookala cycles the Roger Lapébie bike path from Bordeaux to Créon and back.